Using the original aircraft parts we produce a range of very effective, classroom install cabin kits, which can vary in size according to available space and class sizes in your training room. A typical cabin kit would be one side of an narrow body cabin (Boeing 737 or Airbus A320) and four rows of Passenger triple seats, with kits comprising sidewalls, lighting panels, overhead luggage bins and Passenger Service Units (PSU) complete with PAX masks. 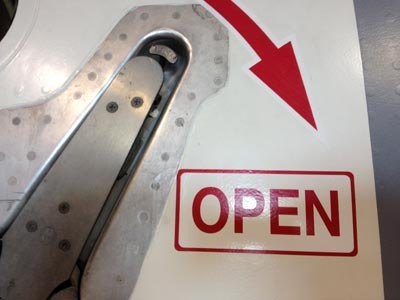 Equipment from our cabin training equipment store can be added to customer requirements, as well as galleys and lavatory modules as and where required. Using the original aircraft handsets we can recreate the aircraft cabin PA and Interphone system for all aircraft types, from a two handset narrow body up to multi-crew station wide body aircraft. Access to aircraft on the ground can be difficult and expensive even for the airlines that operate them. For basic familiarisation we can offer virtual aircraft tours. Allow the Attendant Call button in the Passenger Service Units (PSU) in your training to function as aircraft with our Attendant Call system. From a single PSU to an entire cabin fit out. Manufactured from tough materials, designed to offer long life, reduced 'polishing' of the surface from wear, deceleration pads and mounting hooks, the representative evacuation descent slide offers many benefits over the original slide carried onboard the aircraft. Accurate representation of aircraft slides are manufactured to order and can be customised where required. 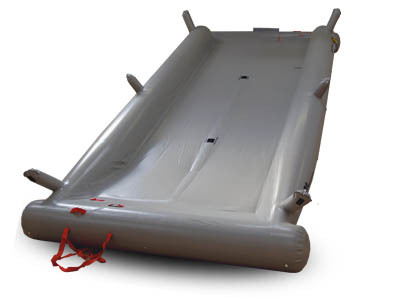 Wet training or dry training models are available where applicable as well as customised aircraft slide rafts and slides for use in the training pool. Using a combination of theatrical fog, sound and lighting effects and our unique electrical and electronic controls we can realistically put multiple scenarios into an existing training rig or offer stand alone systems, such as a lavatory module or galley. Aircraft lavatory bin fire or lavatory toilet heater fire. Virtually any passenger aircraft cabin fire training scenario within the aircraft cabin can be created where required. Being able to display a seamless still or moving panorama outside the passenger windows of the representative cabin trainer, combined with audio playback, offers a much greater depth of realism for all levels of training. Our digital media players are capable of playing still images, video images and audio files without the need for costly PC's or servers. This offers a very competitive way to upgrade any training mock up. Training crew in the normal operation of an aircraft cabin is also available using our systems to feedback and replicate cabin systems. Aircraft doors, galleys, overhead lockers, toilets, lighting and service can all be made more realistic using our cabin systems. Our Aircraft Flight Deck Door Training System (CDSS) replicates the operation of both Airbus and Boeing Flight Deck Doors, as well as the Flight Deck CCTV system, in one unit. 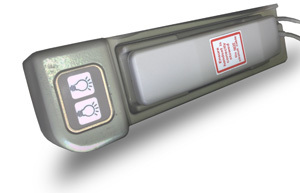 Fully programmable (for variable normal and emergency access codes), as well as featuring live and playback CCTV images, the Flight Deck Door Training System exceeds the requirements of cabin crew operational and emergency access training. The representative cabin door trainer (DT) is one of the most important pieces of training equipment for flight attendant training. Representing aicraft door operation in a variety of modes, from standard operation to door jams and blocked cabin exits, the cabin door trainer (DT) can vary widely in its functions beyond the basic operational training requirements. Generally fitted out with our digital media players, which allow operational sound effects and in window scenario video, the DT is built to customer specification and individual requirements. 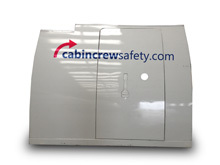 At Cabin Crew Safety we can also upgrade and refurbish representative cabin training equipment and offer sales platform for the purchase and sale of aircraft training equipment that is surplus to requirements. 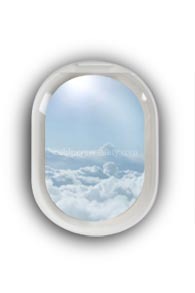 Generally manufactured using the original manufacturers plug and frame the Over Wing Exit (OWE) representative training device can have a variety of functions and passenger cabin parts/equipment to maximise its training effectiveness. This can include passenger seating, cabin luggage bins, bulkheads, cabin emergency floor lighting etc. With a wide range of design, manufacturing and software experience in the field of aviation training we are able to develop simulation systems to meet almost any requirement. An aircraft parts base, airline install base and aviation customers worldwide mean we can draw on unique resources to turn your idea for a project into reality. Upgrading your representative training couldn't be easier! Tell us what you want to upgrade, or classroom install and with what functions. The more information the better. We'll design an upgrade kit. We will design an upgrade that can be simply installed by your engineering team, approved contractor, or by ourselves. Easy, plug and play electronics, ready made cabling and documentation;all to make installation simple and cost effective.